It's very cool to team up with McCormick Grill Mates® this summer as a Master of Flavor correspondent for a new video series called "This Week in Grilling". As a Master of Flavor correspondent, I’ll be posting videos about what’s hot in grilling this season, including the latest flavor trends, tips and techniques from the first-ever Grilling Edition of the annual McCormick Flavor Forecast. 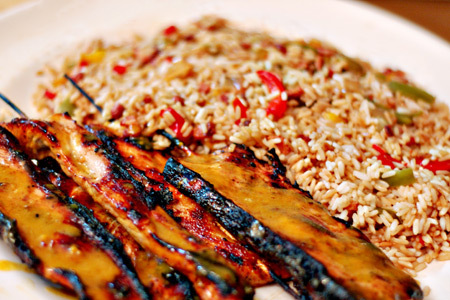 This week, I'm demonstrating a great use of the Grill Mates® Brown Sugar Bourbon marinade. This is just one of the many flavor pairings featured in the Flavor Forecast. This is an all-outdoors recipe that is sure to be a finger-friendly crowd pleaser. It's low on hassle and big on flavor and wow factor. Note: If you can't find the frozen pepper blend, simply chop half each green, yellow and red bell pepper, and a medium white or yellow onion. Slice the pork loin lengthwise to about 1/2" thickness. Thread each loin slice onto a 12" bamboo skewer. Combine the marinade ingredients in a two-gallon zip-top bag, seal and shake to combine. Carefully add the pork skewers to the marinade. Seal the marinade bag, removing the excess air, and set aside for 30 minutes. Put the bacon in a 9x12 disposable aluminum baking pan and set it in the center of the direct heat side of the grill. Let the bacon cook for five minutes, stirring occasionally. Add the peppers and onions to the pan, stir, and cook another five minutes. Add the frozen rice to the pan and flatten it so that it's evenly distributed. Sprinkle the rice with the soy sauce. Cover the pan with foil and move it to the cooler side of the grill. Add all of the glaze ingredients to a disposable aluminum pie pan. Remove the pork skewers from the marinade and put them immediately on the hot side of the grill. Set the glaze pie pan on top of the skewers. Close the grill and cook about three minutes. Flip the skewers over and brush them with the glaze. Close the grill and cook another two minutes. Remove the skewers to a serving platter and drizzle each with some of the remaining glaze. Add the rice to the platter. See more: To check out what's hot in grilling, head over to the Grill Mates® Facebook page each Friday from June through August for the new episode of "This Week in Grilling". Obviously a great job on the video for what was literally your first time! Congrats John! Thanks, Shane! I really appreciate the kind words. Exceptional job, John. Congrats on being selected to partner with the Grill Mates line, they have really done a good job with developing that line. I just did my first video recipe this week as a practice run for one I'm doing this week. I didn't realize how hard it is compared to a regular post. It requires a ton of preplanning, organization, and then there is just getting over the nerves of being on camera. So I can totally appreciate the work you put into this video. Thanks, Chris. It was a lot of work, but it was rewarding and I learned a ton. My future videos should gradually improve. Your video this week wouldn't happen to involve turkey, would it? I am making this! I just added the brown sugar bourbon glaze to my grocery list.